With active hurricane season underway, Island emergency managers are keeping a close watch on the forecasts. And with no major hurricanes since Hurricane Bob 25 years ago, the Vineyard is long overdue for another. Island towns do what they can to prepare. Most preparation occurs at the town level with support from Dukes County, and not everyone is always on the same page. But in the years since Bob, and with limited resources on the Island, collaboration has become key in preparing for natural disasters. But he also noted that complacency has set in. Seated in the town’s emergency command center in the police station on a pleasant afternoon this week, he pointed out the window at a clear blue sky. “When it looks like this right now, and you are trying to get people into shelters because six hours later it’s going to be a hurricane, it’s hard to convince people,” the sergeant said. The Massachusetts Emergency Management Agency (MEMA) discourages unnecessary evacuation from the Island, but Island officials don’t appear to share a standard procedure for how visitors should respond before a hurricane. the load on town resources and personnel. He said the evacuation process would need to happen well ahead of time, since the ferries typically stop running before a storm arrives, and bridges leading off the Cape are closed in winds exceeding 70 miles per hour. He also noted that a hurricane may strike farther inland, as Hurricane Irene did in 2011. “You can’t just pop over to the Cape and think you’re high and dry,” he said. On-Island evacuations present another challenge, with each town needing between 10 and 15 hours to evacuate its low-lying areas, according to MEMA. 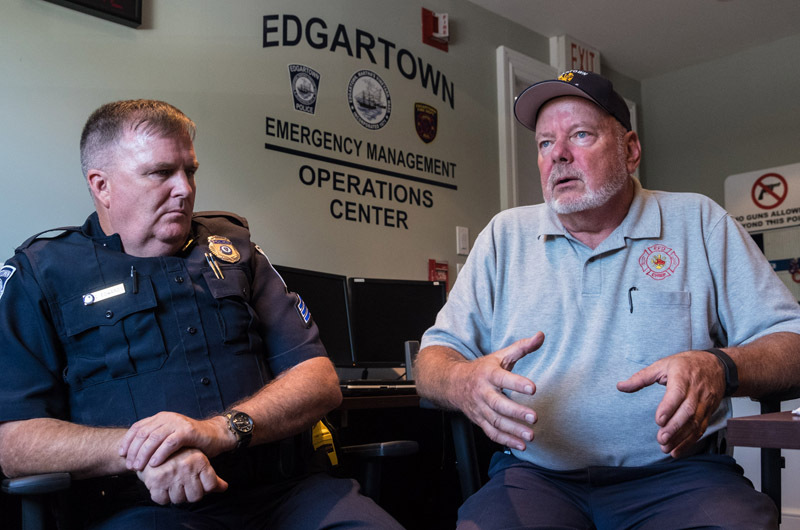 Mr. Shemeth said the speed of evacuation would depend largely on the time of year, and he wasn’t sure if the estimates were realistic for summertime crowds in Edgartown. While much of Edgartown’s south shore would be underwater during a major hurricane, Mr. Carroll takes a more conservative approach to evacuations in Chilmark, where flooding would be largely isolated to Menemsha. He said a sturdy New England house with no lawn furniture or debris to cause damage isn’t a bad place to be during a storm. “You’re probably safest to stay at home and seek shelter after the fact, if you are not in a low-lying area,” he said. 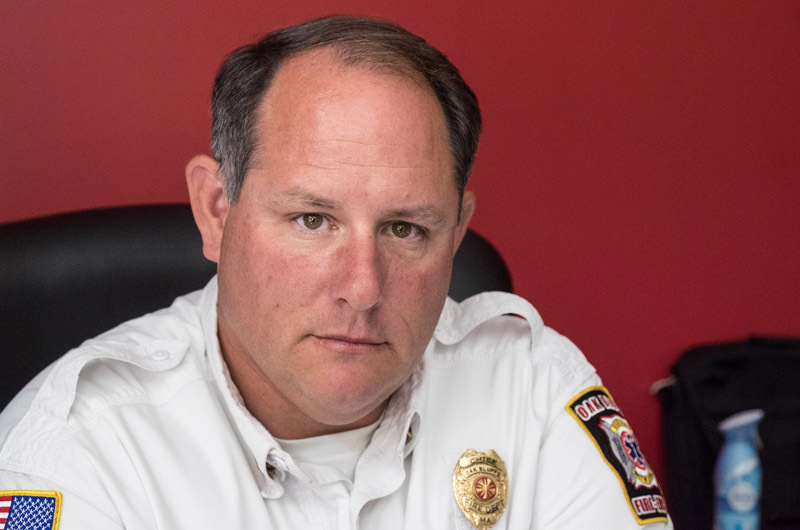 Public safety officials generally agree on the need for more public awareness when it come to storm preparedness — including the question of leaving or staying put. Island residents have access to a wide variety of material telling them what to do in the hours and days before a storm. Much of it is available online and at town offices, and is distributed prior to storms. Residents can sign up for the Code Red call-warning system, or install the Ping4 app to get emergency alerts on their phone, although cell phone users have to sign up for the Code Red alerts separately. But some question whether any of that is enough. 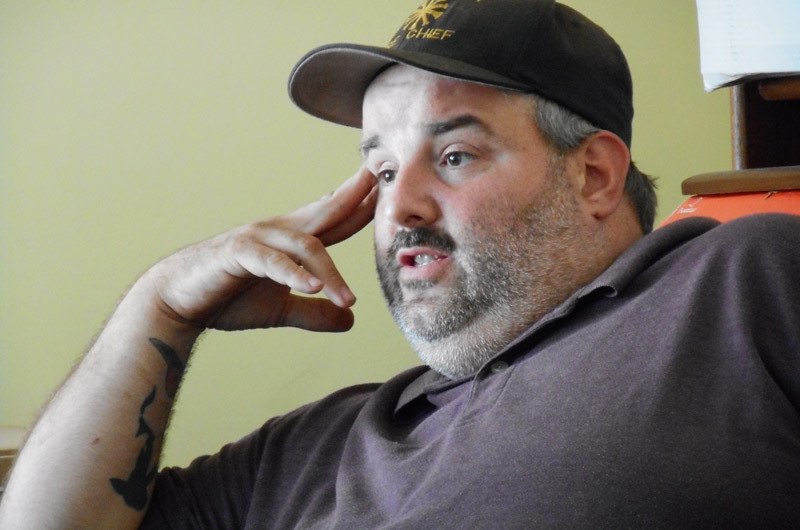 Chappaquiddick resident and emergency management volunteer Stephen Jones said repeated face-to-face communication is the most effective way to raise awareness. Along those lines, Mr. Jones plans to host a hurricane preparedness party at his family farm on Chappaquiddick on Tuesday. The goal is to recruit volunteers to distribute instruction cards to Island flood zones. The instructions include getting to high ground, staying on the Island and planning in advance. Edgartown officials distribute instructional materials prior to a storm, but long-term preparation can be a hard habit to instill. Mr. Shemeth noted the media hype surrounding storms that never materialized, and a younger generation unfamiliar with the power of hurricanes. “It’s hard to get people to prepare for it unless there is an actual threat,” he said. Much of Chappaquiddick and the south shore would be underwater during a category three hurricane, according to the latest MEMA evacuation maps, available at mass.gov. But areas of high-density and waterfront development in Oak Bluffs and Tisbury also face a high risk. Each Island town has its own comprehensive emergency management plan, with resources shared in common. “We rely on having to work in relationship to each other and also with the local contractors and vendors,” Mr. Carroll said. In Chilmark that includes setting up an agreement with local food vendors, since the town does not stock food for emergencies. For Chilmark, at least, the need to purchase food on the spot highlights the value of a regional shelter with food provided by the Salvation Army and staffing by Island volunteers and the Red Cross, in the event of a major hurricane. 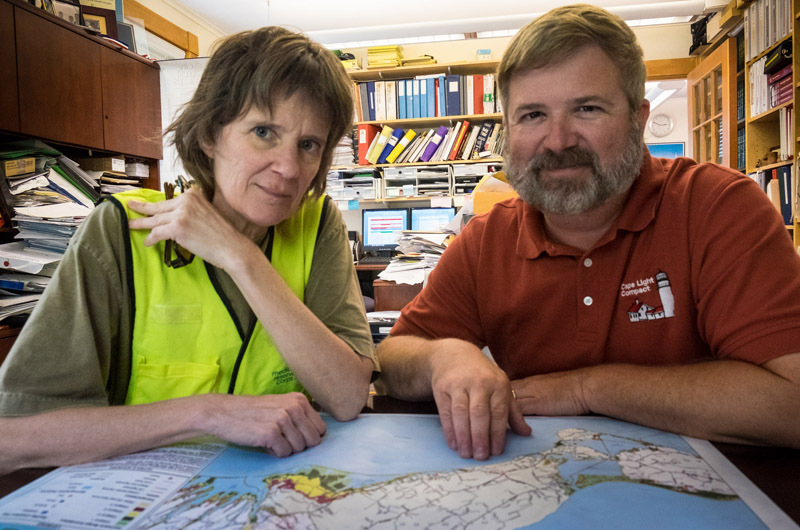 A close call with Hurricane Arthur in 2014 put emergency managers to the test when 150 tourists were stranded on the Island and had to spend the night in the Oak Bluffs and Tisbury schools. And the more common winter blizzards and northeasters keep emergency managers on their toes in the winter. But no one knows exactly how the Island would respond to a major hurricane. “Each town has their own issues to deal with,” Mr. Shemeth said, noting that the effects of a hurricane may differ widely from town to town, as they did during Hurricane Bob, which blocked roads up-Island and destroyed boats in Edgartown, while leaving the north shore relatively intact. Dukes County supports Islandwide communication during a storm, including through a computer program that allows each town to keep track of what the others are doing. But Mr. Shemeth questioned whether a county-wide emergency management plan, as some have advocated, would improve the preparedness efforts. “I think what we do now is perfect,” Mr. Rose said. 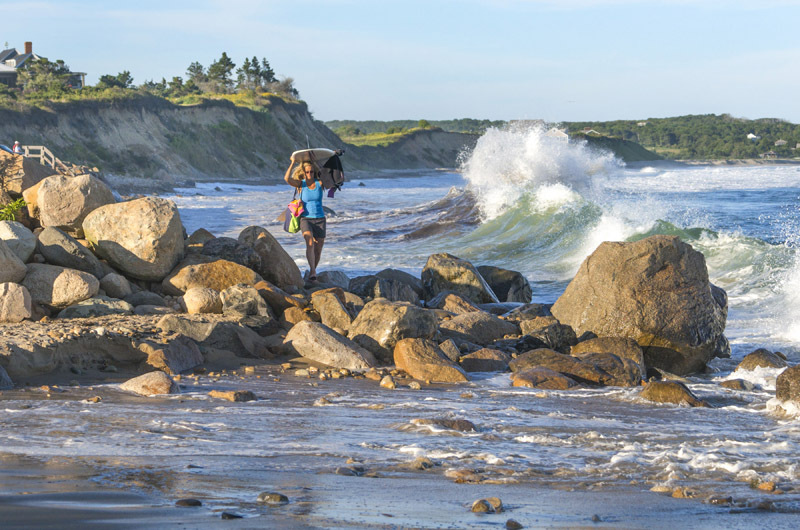 Aquinnah officials had held off since they believed few residents in their town would use the shelter, even in the event of a hurricane, and they opposed paying a percentage fee. The latest draft requires that Aquinnah pay only by the person. The 20-mile trek to the Oak Bluffs School is still a major safety concern, but town officials saw no option but to sign the agreement, since Aquinnah is unable to provide a shelter of its own. And they worry that some residents may be on their own, since town vehicles would be at risk of getting stranded along the way. The regional shelter agreement also requires each town to provide volunteers to staff the shelter, which Aquinnah’s assistant emergency management director and fire chief Simon Bollin said only added to the risk. Town administrator Adam Wilson, who formerly operated an Island taxi company, recalled being asked by Edgartown officials some time ago to help transport people in the event of an evacuation. “I was under the assumption that it was a public service,” he said, suggesting a similar approach for Aquinnah. Such a dramatic headline! Love it! It would not hurt all the town's to work together with one central location such as the County building. The county emergency manager puts a lot of work into trying to get everyone on the same page. He should be commended even if Edgartowns police and fire think they can do it all on their own. It takes a stronger person to accept help than to deny you need it. Everyone should work together so please try to remove the egos and work together as an island. A lot of rain will be good, bring it on. Hariph's Creek Bridge was washed out in the 1954 hurricanes although I do not remember which one.